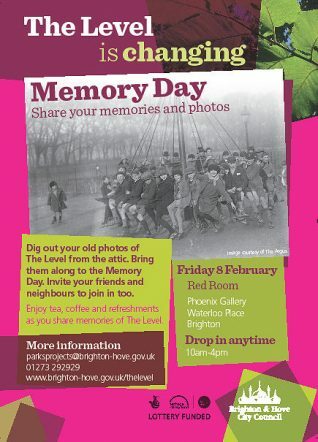 A Memory Day to share photos and memories of The Level in Brighton is being held in the Red Room at the Phoenix Gallery, Waterloo Place, Brighton, on Friday February 8 from 10am to 4pm. The event is part of a history project being organised by Brighton & Hove City Council to capture people’s memories of The Level. Drop in anytime between 10am and 4pm. Free tea coffee and refreshments. Images of The Level over the last 70 years are being compiled in an attempt to record the many events, both personal and public, that have occurred there. These will then be used as part of an exhibition when work on the restoration of the park is completed this summer, as well as becoming a permanent record of the park’s heritage. People are being encouraged to dig out old pictures and any other memorabilia connected with The Level, such as posters or flyers relating to past events, and drop in to the Memory Day. Items will be scanned or photographed so that you can take the original home with you. You are very welcome – even if you do not have any memorabilia – to share your memories of The Level. The event is open to all and recent memories and photos of the park are wanted, as well as older ones.